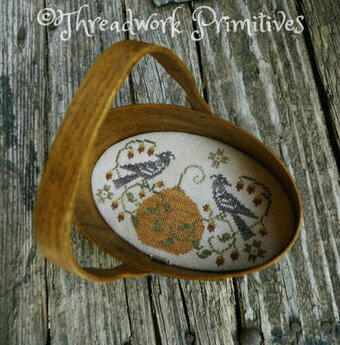 Model stitched on 30 Ct. Butternut linen by R&R Reproductions using DMC and Thread Gatherer Silk n Colors. 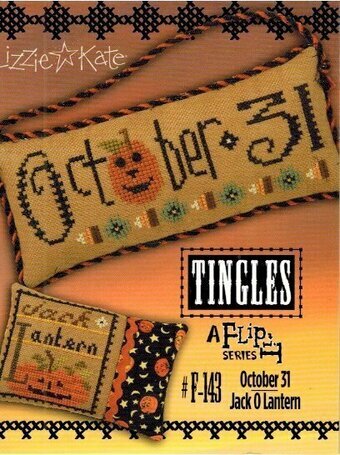 Also buttons from Just Another Button Company. Model stitched on 28 Ct. 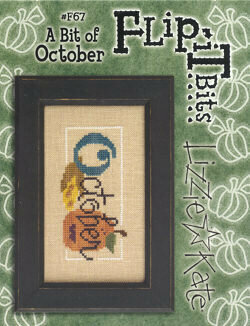 Harvest Moon from Luminous Fiber Arts using DMC floss. Stitch count is 163W x 59H. 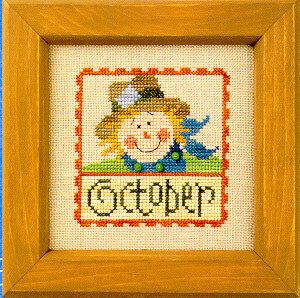 A friendly scarecrow greets us in this seasonal Flip-It stamp design. Model stitched on 28 Ct. Lt Mocha Cashel linen with Gentle Art Sampler Threads and Weeks Dye Works. Stitch Count: 47W x 47H. 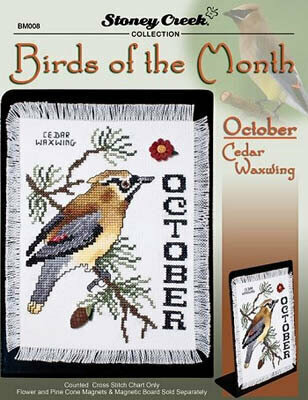 "October - Frost crispens the air, owls hoot from branches bare. 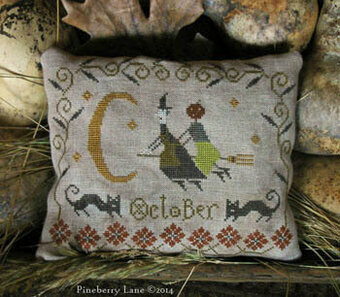 Squirrels hide acorns 'neath the trees, while we gather pumpkins and rake the leaves." 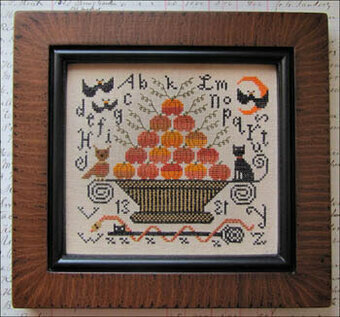 Model stitched on 28 Ct. Natural Brown Linen with DMC floss, Weeks Dye Works and Gentle Art Sampler Threads. (DMC equivalents are 3865 3031 3777 3052 729 3854 975 920 3781 422 310 869)Stitch Count: 168H x 111W. 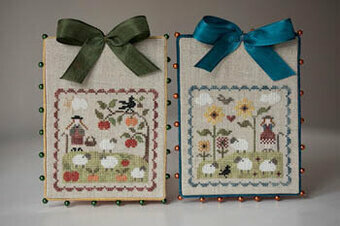 Model stitched on 36 Ct. Legacy linen by Picture This Plus with Weeks Dye Work floss and Gentle Art Sampler threads. Stitch Count: 54x52. Color chart. 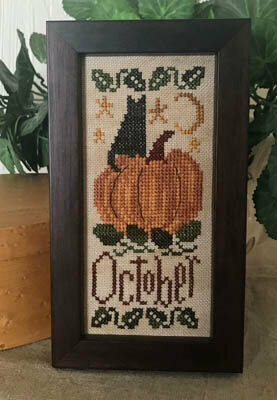 "October". Model stitched on 32 Ct. Vintage Country Mocha Linen with DMC 6 Strand floss. 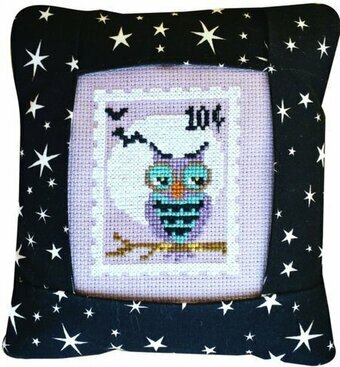 Stitch Count: 96W x 62H. Finished Size: 6W" x 4H". Model stitched over 2 threads on 28 Ct. Vintage Country Mocha Cashel linen with Classic Colorworks floss (or DMC 3021, 934, 783, 976, 300). 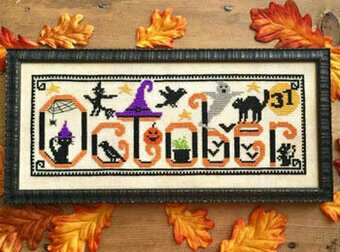 Stitch Count: 31x73. 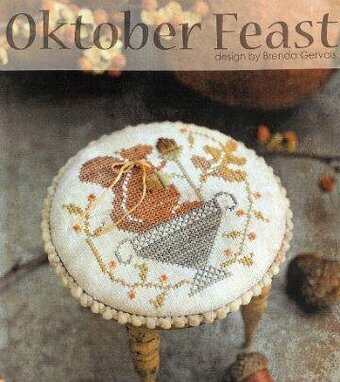 From Hands on Designs and Just Another Button Company. Part of the Chalk Squared Series. 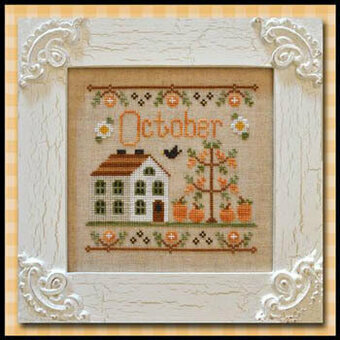 Can be stitched as an individual design or as part of the entire series of calendar florals. Individual model stitched on 32 Ct. Gunmetal linen with Gentle Art Sampler threads (or DMC 977 white 734 3856) and shown with buttons from Just Another Button Company. Stitch Count: 60W x 60H. 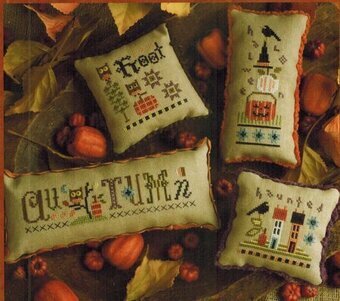 If stitching the entire series, the stitch count is 317W x 317H. 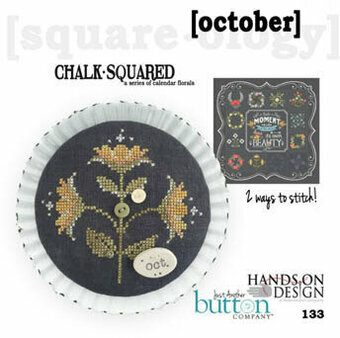 Outline and border for the series is included with Chalk Squared - Moment in Chalk (Item #16-1436). 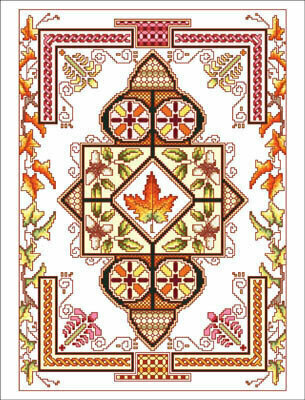 Model stitched over 2 threads on 40 Ct. Creme Brulee linen with Needlepoint Inc Silks (or DMC 730, 780, 742, 970, 921, 919, 680, 301, 918, 420, 310). 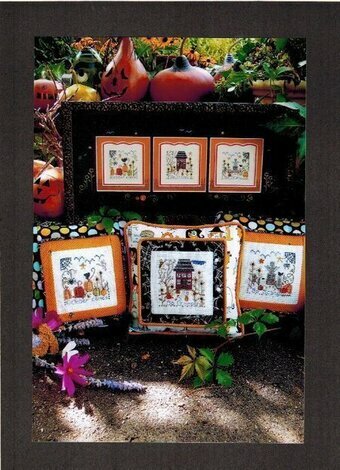 Stitch count: 97W x 86H. 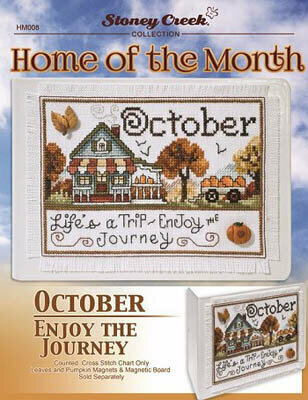 Model stitched on 14 Ct. fabric of your choice with DMC floss and Kreinik #4. 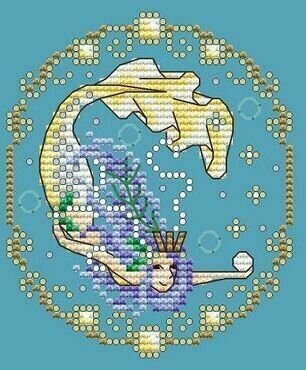 Also calls for Kreinik very fine braid #9400 and beads. Stitch Count: 43W x 52H. Model stitched on 36 Ct. 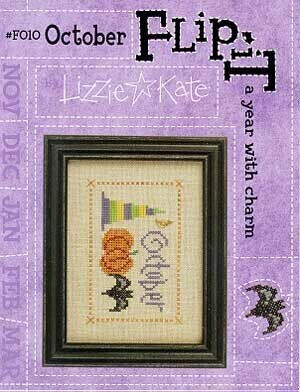 Crystal Voodoo linen by Picture This Plus with Gentle Art Sampler threads, Weeks Dye Works, and DMC floss. Stitch Count: 93x84. Models are stitched on 28 Ct. Light Mocha Cashel using Weeks Dye Works floss (or DMC 309, 435, 597, 3853, 778, 930, 3031, 731, 745, 815, 3354, white, 368). 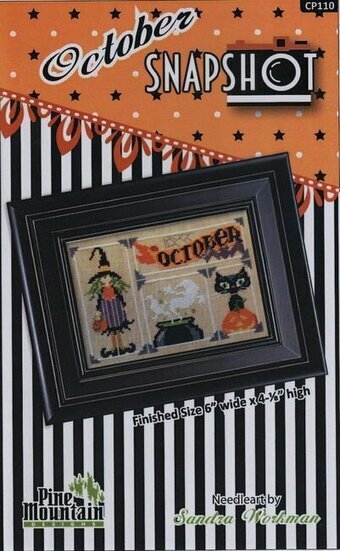 Stitch count is 69W x 41H each. Comes with charms. The Year Book designs can all be stitched together. 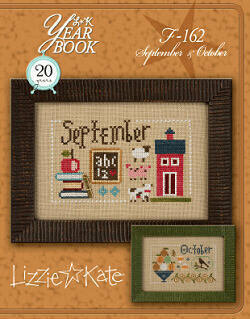 The suggested fabric is 28 Ct Light Mocha Cashel linen - stitch count: 69W x 546H. 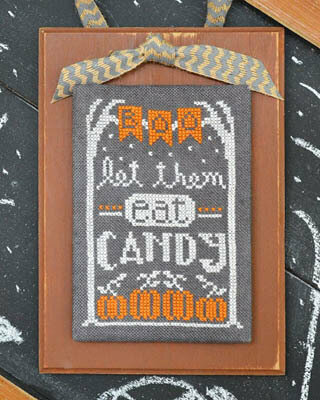 Model stitched on 30 Ct. Confederate Gray linen with Classic Colorworks, Gentle Art Sampler threads and Weeks Dye Works floss (or DMC 471, 310, 3346, 680, 869, 815, 3787, 921, 3362, 3023, 938). Stitch Count: 52W x 49H. 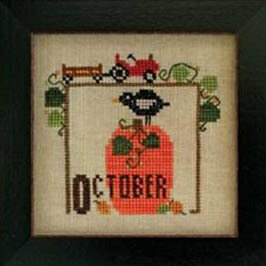 Finished size: 3"x3"
Model was stitched on 28 Ct. Antique White Jobelan with DMC, Threadworx, and Weeks Dye Works. 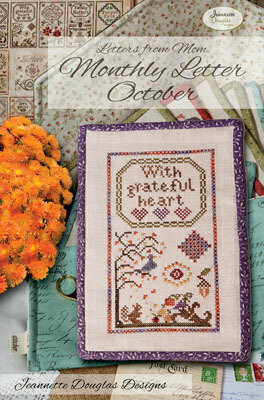 Stitch Count: 67W x 91H Also required, but not listed above, Stoney Creek Magnets MG044 Sunflower. 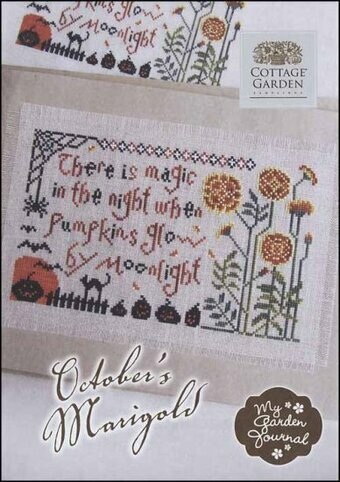 "There is a magic in the night when Pumpkins glow by moonlight." Part 10 of the 12 part My Garden Journal series.Model stitched on 32 Ct. Lambswool linen with Weeks Dye Works floss (or DMC 3362, 3865, 741, 580, 310, 740, 726, 920). Stitch Count: 125W x 74H. Color chart. Model stitched on 40 Ct. Days Gone By linen with Valdani 6 Strand overdyed and DMC floss (or all DMC floss 301, 310, 433, 435, 612, 3021, 3782, 676, 3865). Stitch Count: 171 x 127. Model stitched on 16 ct White Aida using DMC floss. 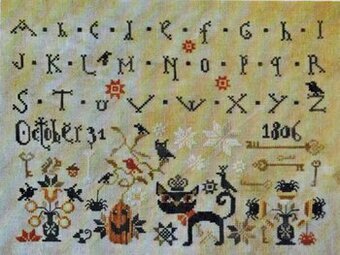 Stitch count 140x200. 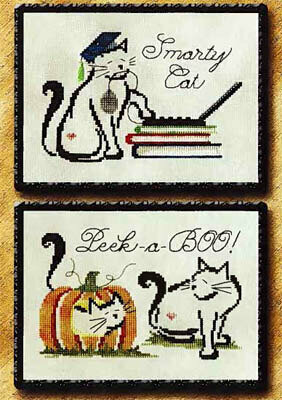 "Smarty Cat" and "Peek-a-Boo". 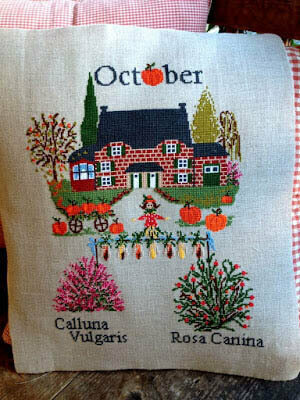 Models stitched on Queen Anne's Lace Hand-dyed Jobelan with DMC floss, Gentle Arts Sampler Threads, Classic Colorworks and Weeks Dye Works. 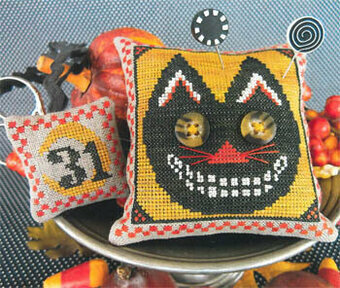 The stitch count for "Smarty Cat" is 92W x 62H. 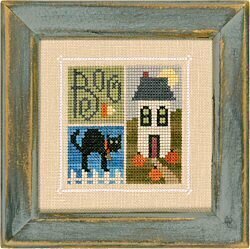 The stitch count for "Peek-a-BOO" is 95W x 64H. 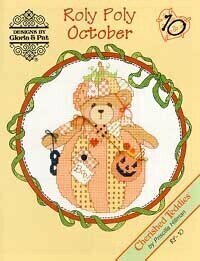 October brings us pumpkins, ghosts, and this cute little Cherished Teddy ready to go trick or treating! 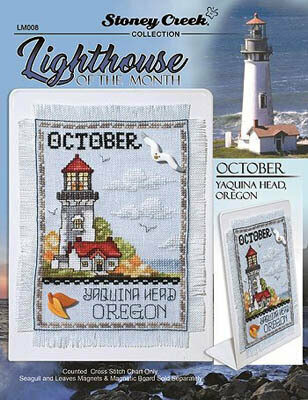 Stitch Count: 90H x 70W. 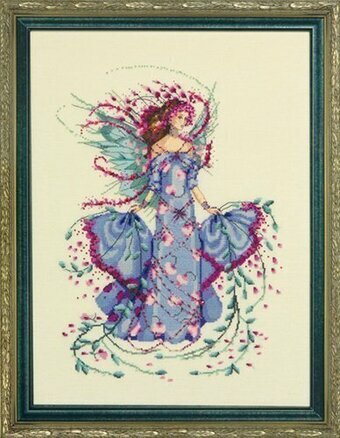 Model stitched on 28 ct cream linen or 14 ct Antique white aida using DMC floss & Mill Hill beads. Model stitched on 28 Ct. White Jobelan with DMC or Anchor floss, DMC #8 Pearl Cotton, and Week Dye Works floss (or DMC 3021). Shown with a button from Stoney Creek. Stitch Count: 66W x 89H. Model stitched over 2 threads on 28 Ct. Lambswool Jobelan with Weeks Dye Works floss and DMC floss (or all DMC 922, 646, 415, 972, white, 907, 321, 208, 310). Stitch Count: 40x58. 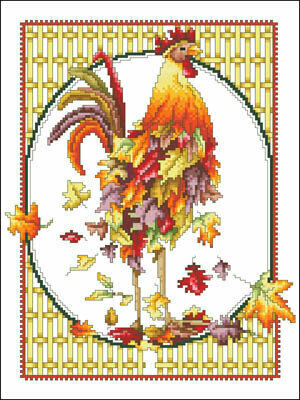 Item: 13-1895 Type: Cross Stitch Patterns. 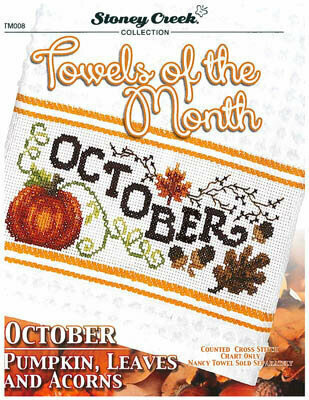 Chart ten of a twelve part series - featuring the month of October. 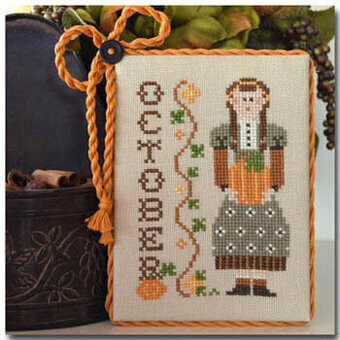 This perpetual calendar is presented in 48 parts - 4 parts for each month of the year - 12 charts in all. The models are shown stitched on 14 Ct. Antique Brown Perforated Paper with Crescent Colours. 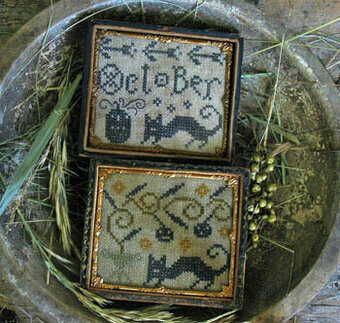 Weeks, or Gentle Art Sampler threads choices are given as well. (DMC alternates are 3865 310 3371 301 3776 333 550 209 327 554 500 501 732 3051 472 3348 791 792 793 340 341 794 3831 3832 3833 3855 415 647) The 4 parts of each month are shown mounted on custom die cuts and in an Ackfeld Calendar Holder (See January pattern list for holder).